This four-day aid climbing and big wall technique seminar is designed for competent leaders who wish to expand their horizons and their climbing ability by exploring advanced aid and free climbing skills. There is a point in every climber's life when he or she looks at a massive vertical rock face and says, "I want to climb that." Often times the problem is that the rock is too steep and the holds are too small to allow a free ascent. 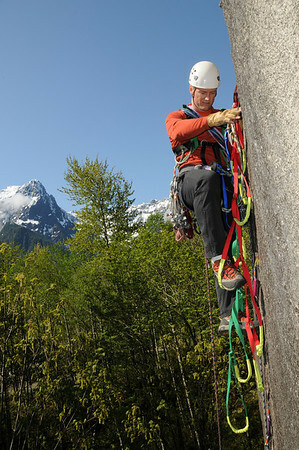 Aid climbing is a specific technique that provides climbers with the ability to get up routes that are too hard to free climb. Most people become aware of aid climbing through the lens of big wall climbing. Big walls are routes that usually take more than a day to ascend. They often require climbers to bivy on a portable platform, and many of these lines require them to use direct aid in order to climb through difficult parts of the wall. Moving on from long multi-pitch routes to big walls is a natural progression for rock climbers. But well-rounded alpinists need these aid climbing skills to add to their abilities in ice climbing, mountaineering, and rock climbing. There are many mountains throughout the world that have routes that primarily require moderate free climbing skills but which also have short difficult sections. A basic understanding of aid opens up thousands of new routes to the well-rounded alpinist. The American Alpine Institute's four-day aid climbing and big wall technique seminar is designed for competent leaders who want to expand the number of routes that they can climb and raise their climbing ability by exploring new techniques and concepts. This course will broaden your free climbing skills as you learn aid because we will introduce you to new free climbing skills as well as aid climbing methodologies. One of the highlights of the course is a night spent on a portable ledge on the side of a cliff. Because aid climbing is so technical in nature, the Aid Climbing and Big Wall Techniques course is only offered at a two-to-one climber-to-guide ratio. The course must have a minimum of two students registered to run at the published price. There is a minimum of two participants for this course to run at the public rate. With one participant we will consider this a 'private course' and charge private rates. You may also contact us about scheduling privately guided days outside of the public dates listed above. Climber working his way up Cerro Torre in Patagonia, Argentina. Join us in one of several stellar rock climbing locations across Washington and Canada, including: Leavenworth, Index, Squamish BC, and Mt. Erie. This course will teach participants to become skilled free climbers on moderate ground and safe, competent belayers.